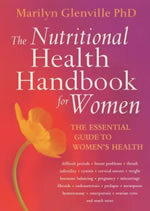 The book for every woman who cares about her healthThe Nutritional Health Handbook for Women tells you everything you need to know about the most effective ways to treat all aspects of your health naturally.Top nutritional therapist and women’s health expert Dr Marilyn Glenville believes that many female health problems are caused by incorrect nutrition and can be dramatically improved through simple changes to your diet and lifestyle.Based on 20 years of clinical experience and research, her approach is proven, highly successful and non-invasive. So if you want to learn how to take control of your own health and at the same time find out what choices are available to you both medically and naturally, then you should send for this book now. If you would like to find out more about how to improve your health generally or you want to find out more about a specific health problem then please visit Women’s general health problems information page.